We also do ask the same question. See our findings here! When it comes to compatibility, Evernote is available for almost all. The service offers applications for computer, smartphone, tablet and web as well. Evernote has apps for Windows (computer & smartphone), Mac OS X, iOS, Android, Blackberry etc. It synchronizes notes among all connected devices. Evernote browser extensions can assist you while you’re searching for an information and need to keep track on the findings. You can download Evernote apps and extensions from this official link. Evernote has a productive and smooth user interface. Two of the closest competitors of Evernote is Microsoft’s OneNote and Google Keep which also offer similar service, but lack its wider editing tools. While Microsoft OneNote and Google Keep perform mainly as notebooks, Evernote is more than merely a notebook. It can be used as an information center, where you can store, process, mine and share information. The service allows to add media with your text notes. You can add an image, for noting more detailed memo. Evernote allows adding audio to your notebook. Evernote premium enables video embeds on the notebook. It also can make presentations from your data which will fit all screen sizes. You can set reminders to get alerts at predetermined times. Evernote camera functions let you take a picture and put it inside the notebook. Its optical character recognition technology scans image texts and also understands handwriting. Sharing notes with co-workers and friends is also possible in Evernote. The app allows notebook sharing via email or as a link. Single notes are sharable via link, email, Facebook, Twitter etc. If you have a business subscription, others can edit your shared notes. You can also encrypt a part or whole note text in Evernote that will be only visible with a password. With Evernote Web Clipper browser extension, you can take notes as you browse the web. The small tool helps a lot to gather information and ideas by storing texts, images, screenshots or even the whole web page you visit. There is huge buzz on the web as well as in the real world on Evernote. People are talking about their liking and disliking regarding the app. Some say that they enjoy the sync feature offered by Evernote’s multi-platform app collection. Users appreciate its OCR, location tagging and multimedia note taking ability. Others prefer Evernote for its premium features like extended storage space, enhanced search functionality, better customer support etc. A good number of people say that they like Evernote for its handy tools, especially the capability of web clipping, note sharing, collaborating and so on. However, this is not the whole picture. There are many other users who are not satisfied with Evernote. Some people complains that they are facing problem with sync, which is one of the core features of the tool. It led them uninstalling the app and reinstalling it with a hope of solution. But Evernote frustrated multiple times. Users shared their bitter experience with the slower support response too. Evernote founder & CEO Phil Libin also addressed those problems in a blog post published earlier this year. 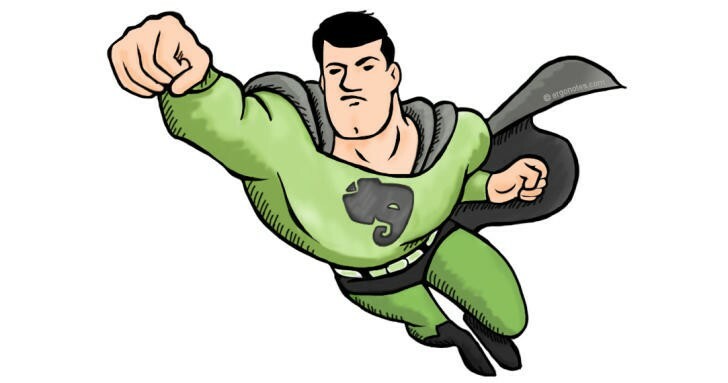 He reassured that the Evernote team is working hard to provide a better and a more stable service. From my personal experience, I faced problems with Evernote web version’s home page. The notes page does not often load at all. It just shows a blank page. The PC version of Evernote app has a huge sync issue. It was unable to synchronize with the server. Even the program went unresponsive while sync attempt. Did you use Evernote? How is your experience? Please share with us and lets discuss here! « Hands on with Cloudfogger, the file Encryptor	» What Makes Copy.com Different from Other Cloud Storages?